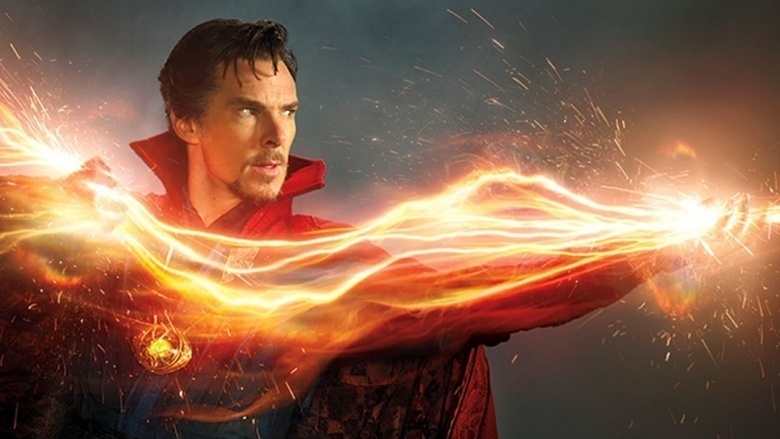 It's no secret that 2016's Doctor Strange is a part of the Marvel Cinematic Universe, but just how connected is the Master of the Magic Arts to his fellow superheroes and his comic legacy? Here are a few Doctor Strange Easter eggs you didn't notice. The flow of time gets a little wacky in Doctor Strange, thanks to the influence of the Eye of Agamotto and the Infinity Stone powering it, but we can safely say that the film takes place in a world that's well aware of superheroes, even if the film never mentions any of them specifically beyond a broad mention of The Avengers. 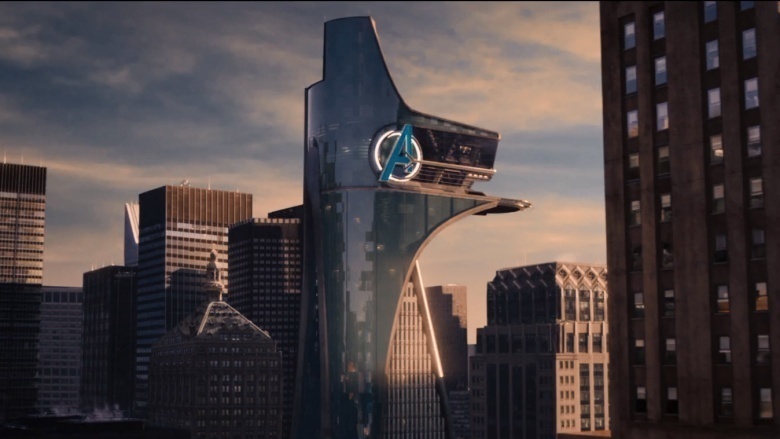 During a few shots in the film, we see the Avengers' tower standing tall over New York. However, by the end of Age of Ultron, the Avengers have abandoned the tower and moved to upstate New York like Rhinebeck hipsters. Either way, hero stuff is going on, so Strange isn't alone. War Machine, or a poor Hammer Industries pilot? Moments before world-renowned surgeon Stephen Strange has the car accident that changes his life, he's heard talking on his phone about a 35-year-old with a spine problem and an experimental suit of armor. 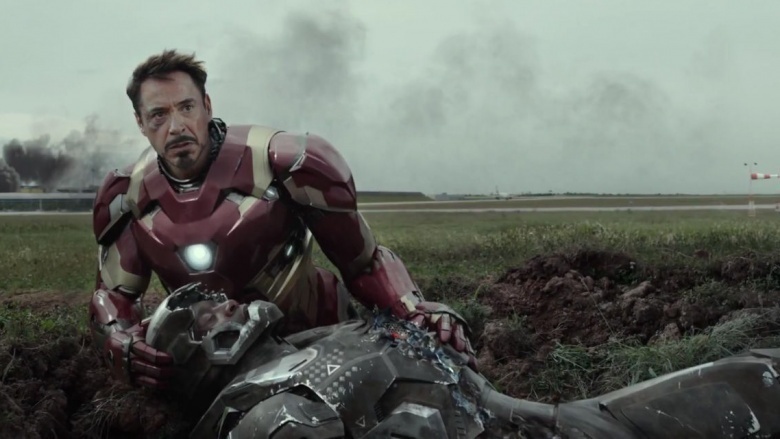 Now, though Iron Man's suits are the most obvious thought here, the filmmakers have made it clear that was definitely not a reference to War Machine's injury in Captain America: Civil War. So the best guess outside of that? If we're lining up the timelines, it stands to reason Doctor Strange begins at least a year or two before the present day in the MCU (since Stephen Strange spends a good bit of time training with the Ancient One). Remember Hammer Industries' attempts to copy Iron Man's suit technology, and how poorly most of those test flights went? The pilot being referenced here could have been a poor Hammer Industries guinea pig who got himself hurt in one of the malfunctioning knockoff armors. If it wasn't Rhodey, that certainly could make sense. Along with being wild and weird, Doctor Strange is also surprisingly funny. One of the biggest laughs comes when Strange starts settling in to learn from the Ancient One, and Mordo hands him piece of paper with the word "Shamballa" on it. Strange asks if it's his mantra, and Mordo corrects him that it's only the wi-fi password. It's played as a gag, but "Shamballa" also has deeper significance in Doctor Strange's history—and the real world. The concept isn't unique to Doctor Strange, as the mystical, otherworldly kingdom has existed in religious texts for centuries. Into Shamballa is also the name of an important Doctor Strange story from 1986, concerning not only the death of the Ancient One, but also featuring Hamir, the one-handed magic man from the temple. While the comics reveal that Hamir is actually Wong's father, the film flipped the script in so many ways that it's unlikely this relationship will be translated to the big screen. Like most of Marvel's heroes, Doctor Strange has also relinquished his title and let someone else fly around in his Cloak of Levitation for a while. In the film, the now-dead guardian of the New York Sanctum was simply called "Drumm." Eagle-eyed readers will recognize the name as belonging to brothers Jericho and Daniel Drumm, the latter of which was a voodoo houngan. Comic things happen, and the two are joined in spirit and become Brother Voodoo. 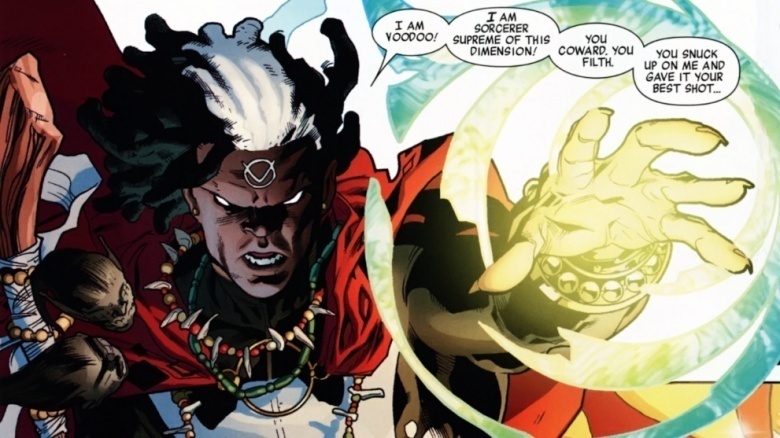 At one point, Jericho Drumm takes possession of the Eye of Agamotto and the name "Doctor Voodoo," who also happens to be the Sorcerer Supreme. It doesn't last forever, but it's clear that the MCU is planting magical seeds everywhere. The Doctor Strange prelude comics confirm that this dead guardian was Daniel Drumm. Not only that, but the comics (and a brief moment in the film) also feature Tina Minoru as another Master of the Mystic Arts, a character who is a secret practitioner of dark magic in The Runaways, and mother of powerful witch Nico Minoru. So, the Runaways have basically been confirmed in the MCU, and pet dinosaurs can't be that far behind, which is the greatest thing ever. The hierarchy of power in Marvel Comics is confusing, and even though there are only a few big, bad guys in the MCU, it's already reaching perplexing levels of power. Thanos is no slouch, but he's not much without his Infinity Stones. Dormammu seems like a big deal, but he also seems like a less-intelligent version of Galactus so far. So when Mordo mentions the Staff of the Living Tribunal, you know stuff is going to get crazy. 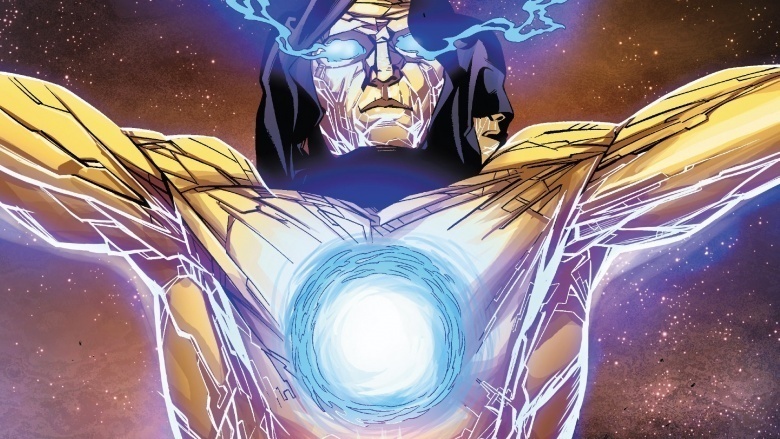 Though a bit obscure, the Living Tribunal is one of Marvel's many godlike characters: an enormous, all-powerful dude with a floating head that has three faces. He essentially keeps all the multiverses in balance and only has one being above him in terms of power. And somehow, some part of that is captured in a wooden stick in the middle of nowhere. 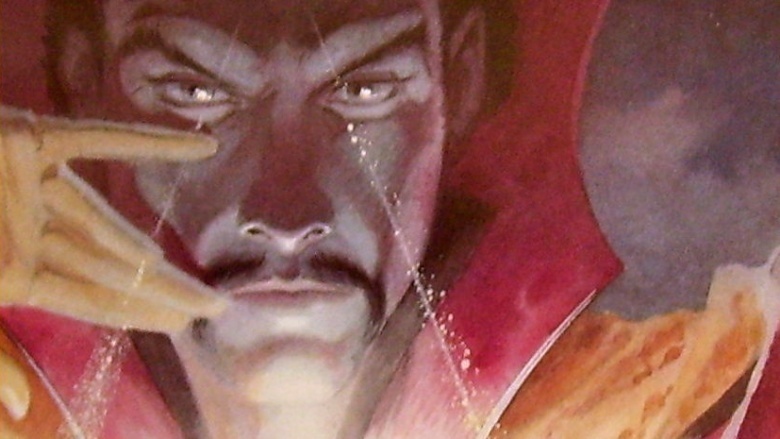 Doctor Strange has a few signature magical talismans. Among them are the Eye of Agamotto, which causes no end of trouble for Strange in both the film and the comics, and the Cloak of Levitation. Curiously missing is the Book of Vishanti, which is basically Strange's bible and encyclopedia, though it's probably locked up in Wong's well-guarded library, right alongside the book that Strange does use, the Book of Cagliostro. If you've been watching Agents of S.H.I.E.L.D., you know that there's another magical book floating around the MCU at the moment as well: the Darkhold, which actually shares a few pages with the Book of Cagliostro. Not to mention that the Book of Cagliostro has a few pages that were written by God. And probably a few by James Patterson. 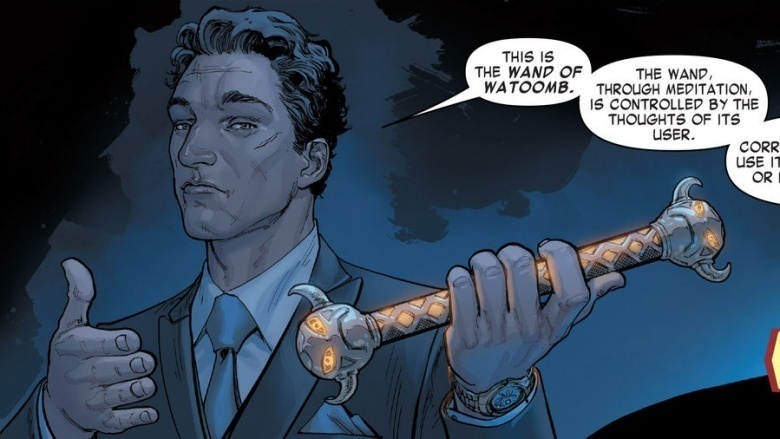 We also get a glimpse of one of Strange's other signature weapons: the Wand of Watoomb. Even though it's Wong who wields the item in defense of the Hong Kong Sanctuary, that weird, knobby, horned wand is unmistakable. Blu-ray replays will probably reveal even more of Strange's armory locked up in the Bleecker Street Sanctum. Which, by the way, is located at 177A, just like in the comics. 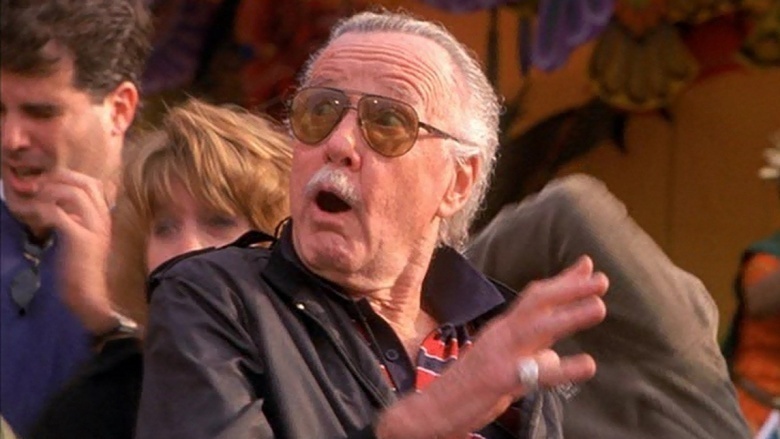 The obligatory Stan Lee cameo was so much more than just an old dude reading on the bus. The book that Lee is giggling at is The Doors of Perception by Aldous Huxley. 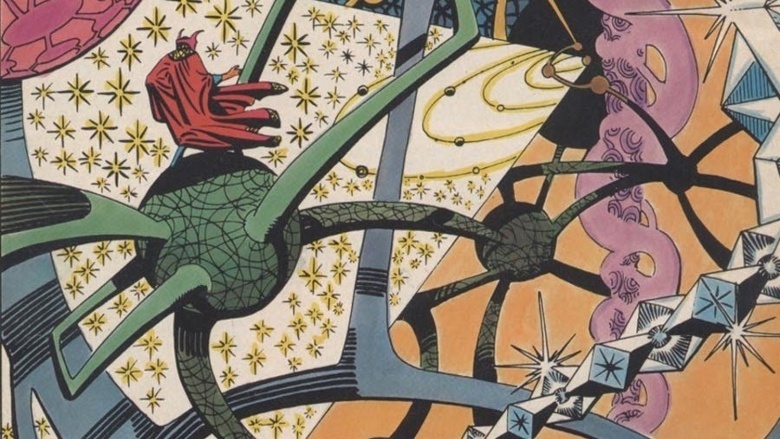 Not only is it a literal reference to Strange's perception of reality being forced open, but the book is pretty much an essay about a psychedelic drug trip, which is no small comment on both the dazzling special effects of the movie, and the Dark Dimension, which not only looks like a Steve Ditko drawing come to life, but is nearly a spitting image of those 1970s Third Eye blacklight posters Marvel used to sell for your teenage drug den. Far out. 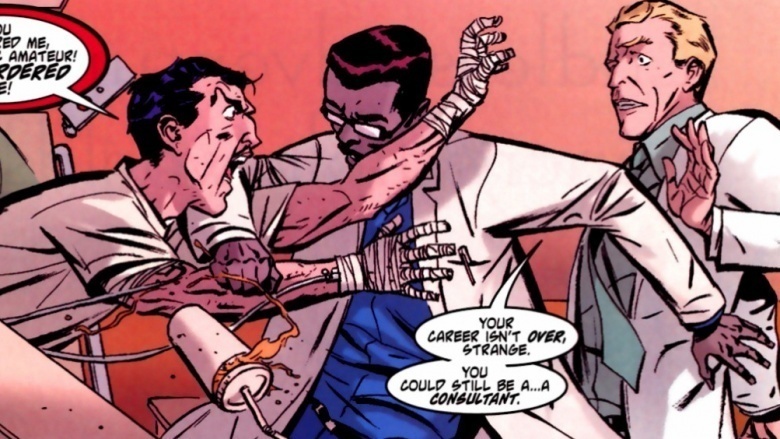 The jealous, potato-chip-loving Doctor Nic West is actually a character right out of the pages of a 2007 Doctor Strange story called "The Oath," where he plays the doctor who bungles Strange's busted-up hands beyond usefulness. He begins magical training, just like Strange, but he's a C student at best. Eventually, he accidentally kills someone with magic, and he and Strange duke it out, with West falling off a building to his death. It's a far worse fate than hitting the magical potato chip jackpot. And that scene where an astral Strange helps someone with an operation on his own mortal body? Straight out of The Oath, too. 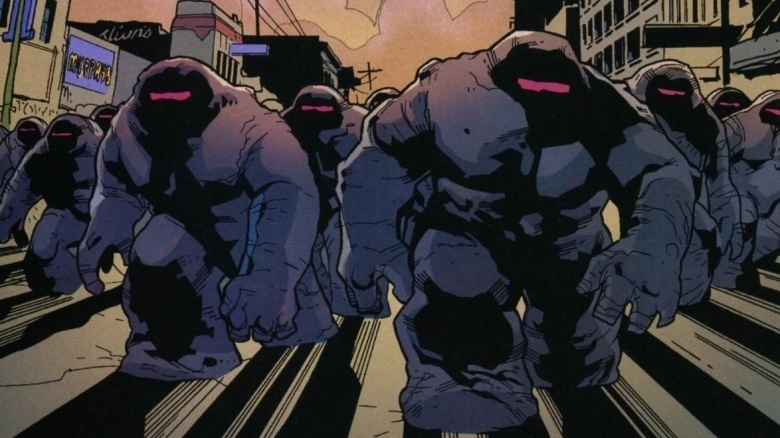 The Dark Dimension basically has three main inhabitants: Dormammu, his sister Umar, and the Mindless Ones, who are Dormammu's featureless, grey, cyclops space grunts. At the conclusion of Doctor Strange, we see Kaecilius and his minions get sucked into the Dark Dimension, losing all their features in the process … and looking suspiciously like Mindless Ones during their transformation, with a glint of light replacing their faces. It seems likely that anyone who allies with Dormammu and his promise of eternal life will eventually be transformed into a Mindless One. What this means for the Ancient One, we'll probably never know. A very subtle nod to Captain Marvel? When Doctor Stephen Strange is fielding options about potential patients during that fateful drive, he's also pitched the case of a woman in her 20s who is struck by lightning, and has an electronic implant to help her combat the voices she hears in her head. That doesn't really sound like it connects to any obvious story within the Marvel Comics canon, but it wouldn't be the first time Marvel changed up a story when bringing it from page to screen. 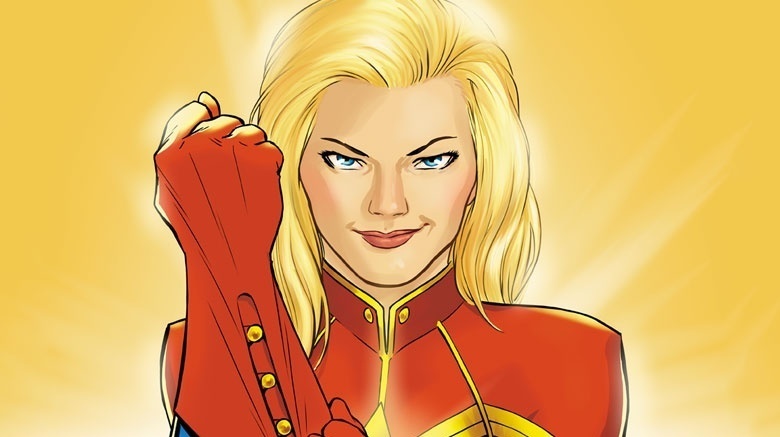 When asked by Entertainment Weekly if it might be a very subtle reference to set up the introduction of Brie Larson as Carol Danvers in the upcoming Captain Marvel film, the director referenced the 2001 film Don't Say A Word, quipping, "Remember that Brittany Murphy movie where she goes 'I'll never tell?'" Hmm. It wouldn't be the first time Marvel offered a nod to a coming character a few years ahead of time (e.g. Doctor Stephen Strange getting a namedrop back in Captain America: The Winter Soldier). It isn't crazy to think they'd sprinkle in an Easter egg this far out if given the opportunity. For now, we'd file this one under "Maybe." There's no doubt Doctor Strange is one of the trippiest movies Marvel Studios has ever attempted, and though it obviously took some of its visual inspiration from mind-bending movies like Inception, there were also some stunning homages to the comics canon. When Doctor Strange enters the Dark Dimension, he lands in a world of bizarre neon balls connected to one another on strands. For most, it was simply a cool visual. But for longtime fans, the scene was familiar: The shot was practically a Steve Ditko art panel brought to life, calling back to the stunning visuals that were a big reason the classic Doctor Strange comics were so successful—and wildly original—in the first place. When Doctor Strange fights Kaecilius for the first time, the Cloak of Levitation jumps in to lend a hand—and lead him toward the most useful weapons, even when he doesn't agree. In one memorable scene, the cloak fights Strange as he tries to grab an axe from the wall, yanking him toward a more magical weapon. This was likely a sly nod to the comics, where Doctor Strange often wields an axe (at least when he uses weapons) as his tool of choice. 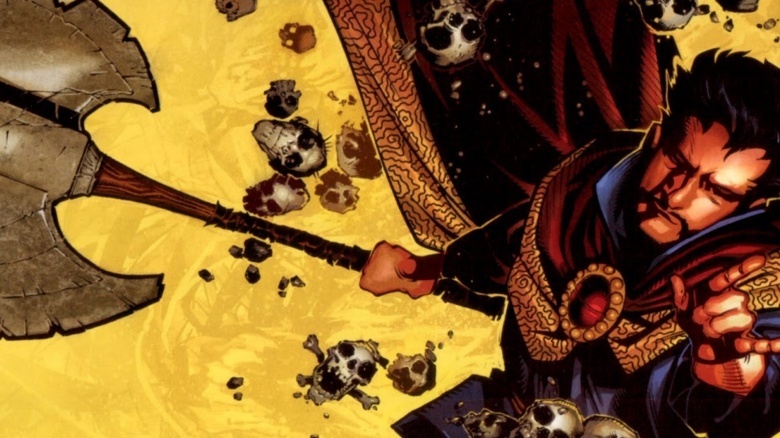 For example: When magic was stolen from the world in the recent Last Days of Magic comics arc, Strange's trusty axe was a crucial part of the arsenal that helped him defeat the evil Empirikul.